With equities losing the sp'2100 level, the VIX broke the downward trend, settling higher by 6.3% @ 13.86. (intra high 14.69. Near term outlook offers the sp'2060s, which should equate to the VIX in the 17s... if briefly. The big 20 threshold looks out of range. Equity bears at best might see the sp'2060s in the near term, and that should equate to VIX maxing out somewhere in the 17s... perhaps 18s. Certainly, a daily close in the 20s look highly unlikely in the near term. US equity indexes closed moderately lower, sp -9pts @ 2107 (intra low 2098). The two leaders - Trans/R2K, settled lower by -0.5% and -0.6% respectively. Near term outlook offers a minor retrace to the 50dma in the sp'2060s, whilst the broader trend remains powerfully to the upside. In the scheme of things... a day of mere moderate weakness, but it does open the door to a minor retrace into the sp'2060s. There is plenty of data in the coming days.. so Mr Market will have plenty of excuse for some more 'moderately' dynamic price action. US equities look set for renewed weakness into the close, with the sp' <2100, along with VIX in the 14s. 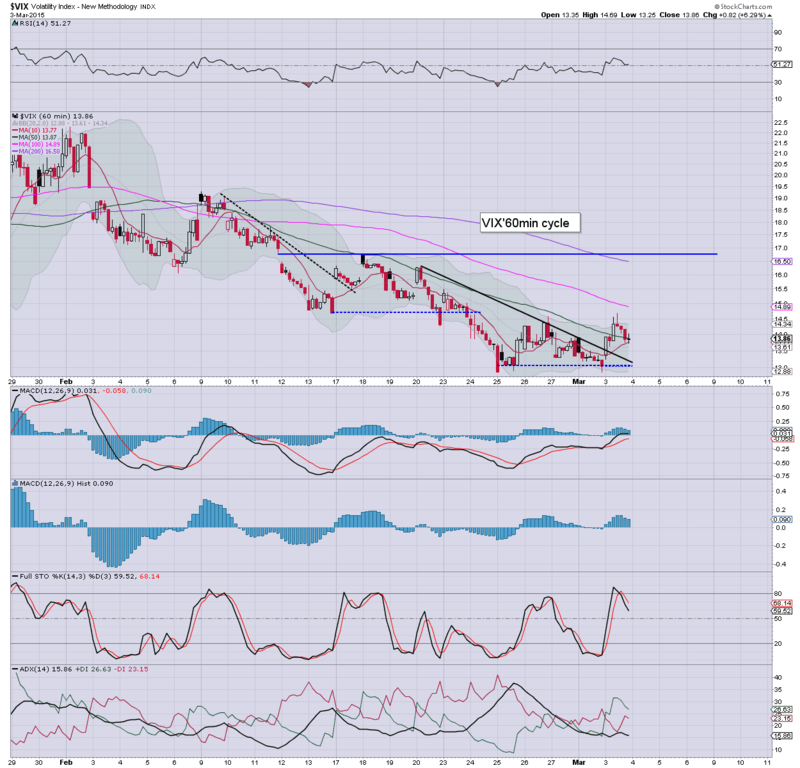 Metals remains a touch weak, Gold -$1. Oil is battling to hold gains, +1.1%. Notable weakness, STX -4.7%.... having seen a spike-fail yesterday. US equities remain moderately weak, with the sp' having earlier slipped to 2098. 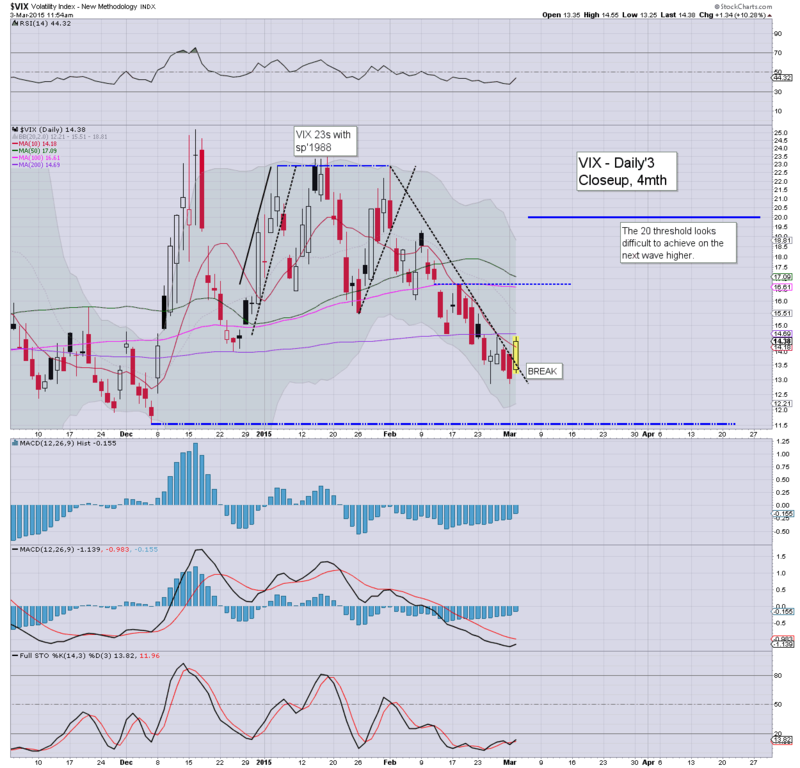 VIX is confirming the move, having already hit 14.68. Renewed equity weakness into the close looks probable. Metals remain a touch weak, Gold -$1. Oil is battling to stay positive, +0.6%. The technical damage has been done... a retrace should play out fully across the next few days. ALL the indexes are offering a bearish MACD cross - whether already today... or tomorrow. Best case for equity bears remains sp'2060s... which will likely equate to VIX 17s. With bid rumours still circulating... this is surprisingly strong today. 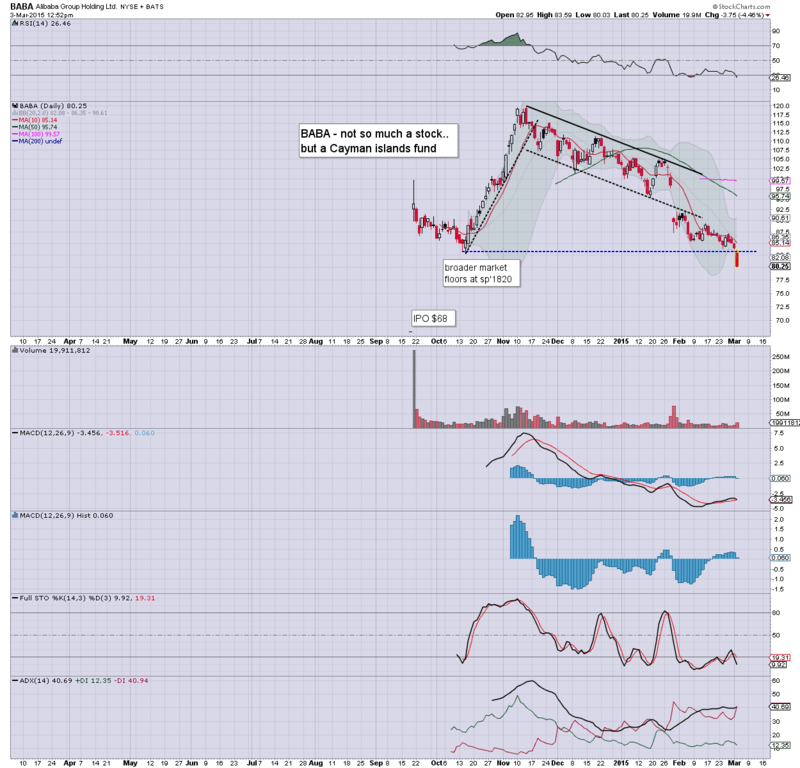 Last August, DISCA was in the mid $40s.... a move to the big $50 threshold seems a given... just a matter of when. 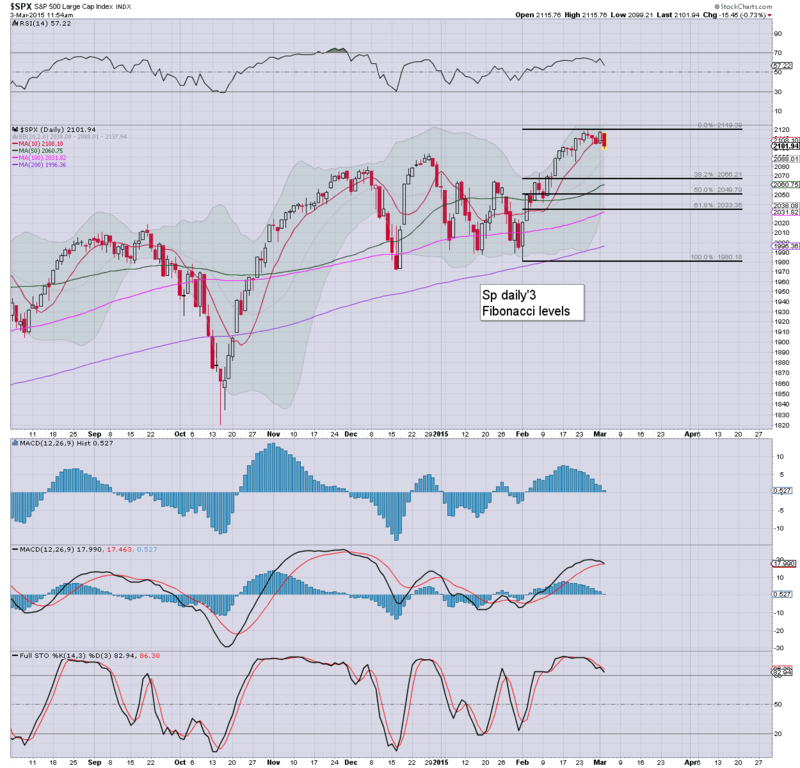 US equities appear to have begun a retracement... if very minor. 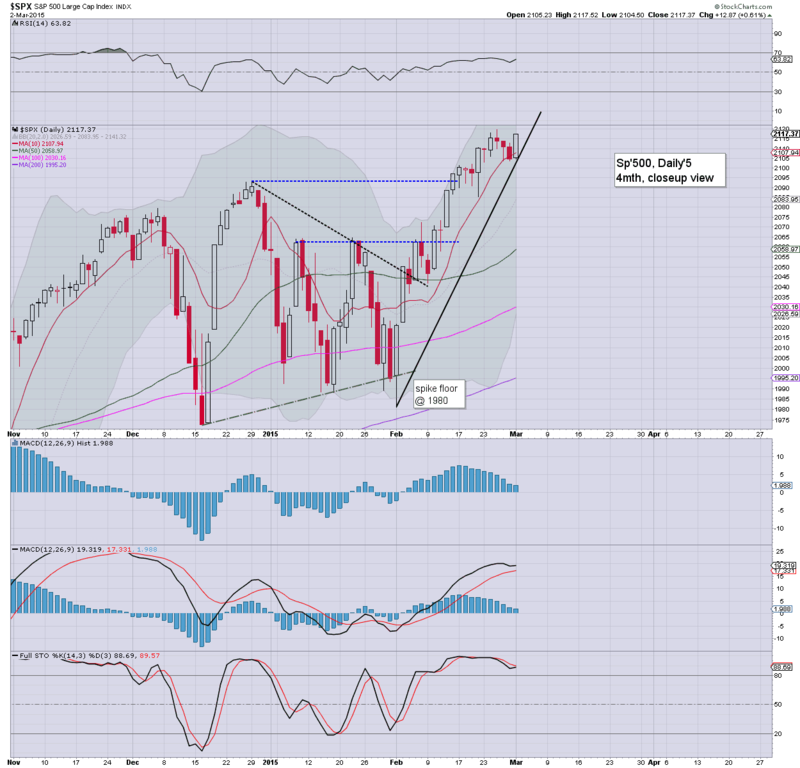 There are multiple aspects of support in the sp'2060s... which will probably equate to VIX in the 17s. Metals remain weak, Gold -$1. Oil has built sig' gains of 1.3%... no doubt on war-talk. I'm aware some are seeking a move to just the 2080s... but it'd seem more natural for a slightly bigger move to test the 50dma. Certainly... a move to the 2060s is viable this week, but sustained trading <2050 looks highly improbable... not least with the ECB QE-pomo set to begin. Notable weakness: BABA, -4%.. having failed to hold the key floor. There is now rather obvious downside to the original IPO level of $68. The US market has finally started to break lower, having ramped from sp'1980 to 2119. 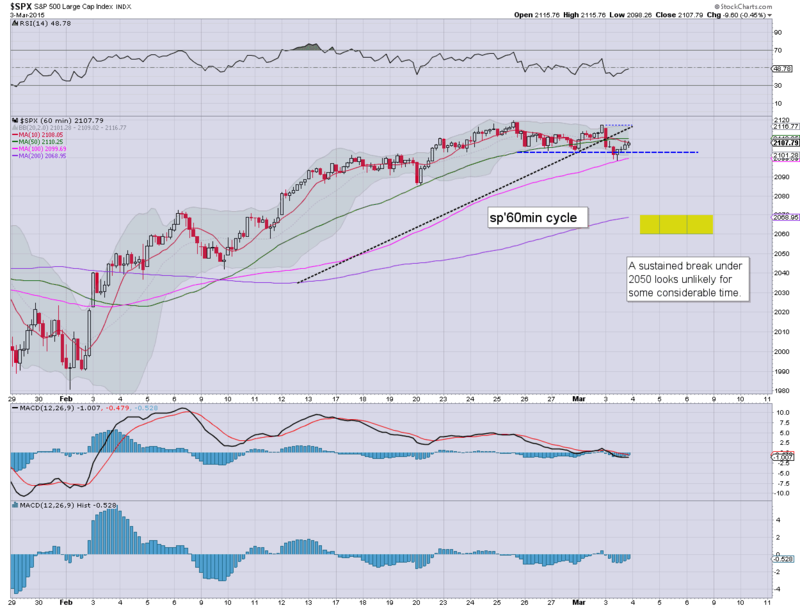 A natural retrace would be to test the rising 50dma in the sp'2060s.. where there are other aspects of support. Metals remain weak. Oil is trying to build gains, +0.9% on war talk from Netanyahu to the US Govt. *the VIX is most telling...a key break to the upside... first target are the 16/17s. The 19/20s look out of range on a retrace to just the sp'2060s. So.. we're finally seeing some breaks... with the daily MACD cycles seeing bearish crosses all over the place. A move to the 2060s looks due.. but that is probably all it will be. US equities remain in the red, but the declines certainly don't rate as significant, and there will always remain the threat (if not likelihood) of latter day upside. Until a break <sp'2100, there is simply nothing for the bears to get even marginally excited about. *metals have just turned red, with Gold losing gains of $8.... outlook across the coming spring/summer... looks pretty dire. Overall, it remains pretty tedious. Underlying pressure remains powerfully to the upside. It remains lame how even a brief retrace/test to the 50dma - now in the 2060s, is about the best the bears can hope for. The giant 2K threshold looks set to hold for some months... if not the year. At best... on a break <2100, VIX to the 16/17s.... with the 20 threshold now out of range on the next up wave. Eventually... Ford should see a monthly close in the $18s... which will be a key warning that a broader hyper-ramp is underway in second half of the year. 11.27am... Ohh... now Net' has mentioned 'Game of Thrones'. So.. is he Drogo.. or... ? 11.34am.. BREAK.... VIX 14s.. with sp'2101... first target is 2065. US equities open moderately lower, but until sp' <2100, along with VIX 14s, it all counts for nothing. Gold is in bounce mode, +$8. Oil remains broadly weak, -0.4%. *arguable break of trend on the VIX... suggestive sp' will lose 2100 today. As ever... it usually remains a case of morning weakness... and then latter day algo-bot melt. Break levels remain... sp'2100, with VIX 14s. If those are broken, then further weakness to the 2080s... 2065 'best case'. From there.... up into the sp'2200s. 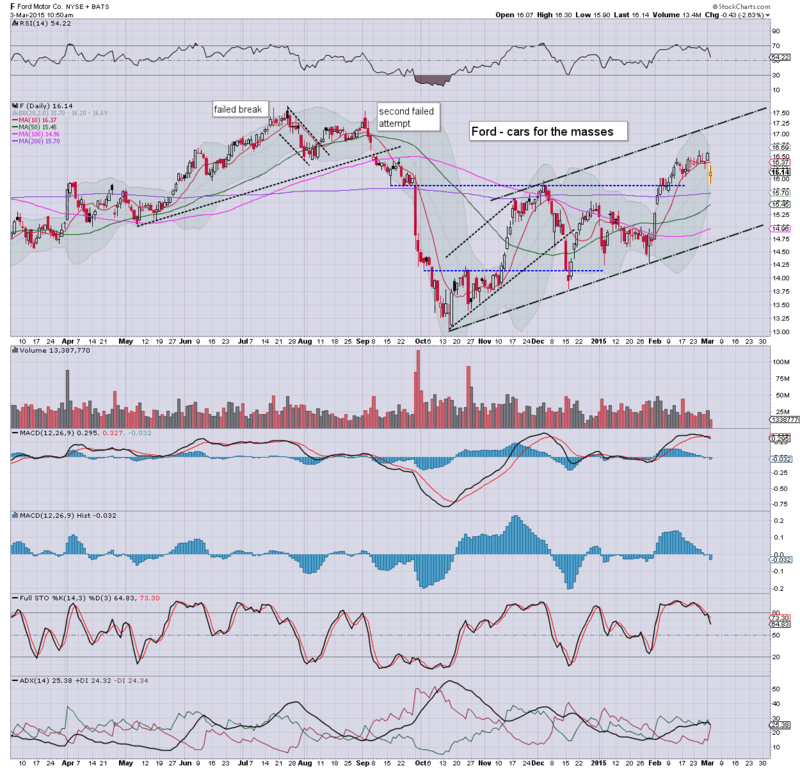 sp'2200s... even a retrace to the giant 2k threshold will require a 10% drop of 200pts... which will be damn tough. 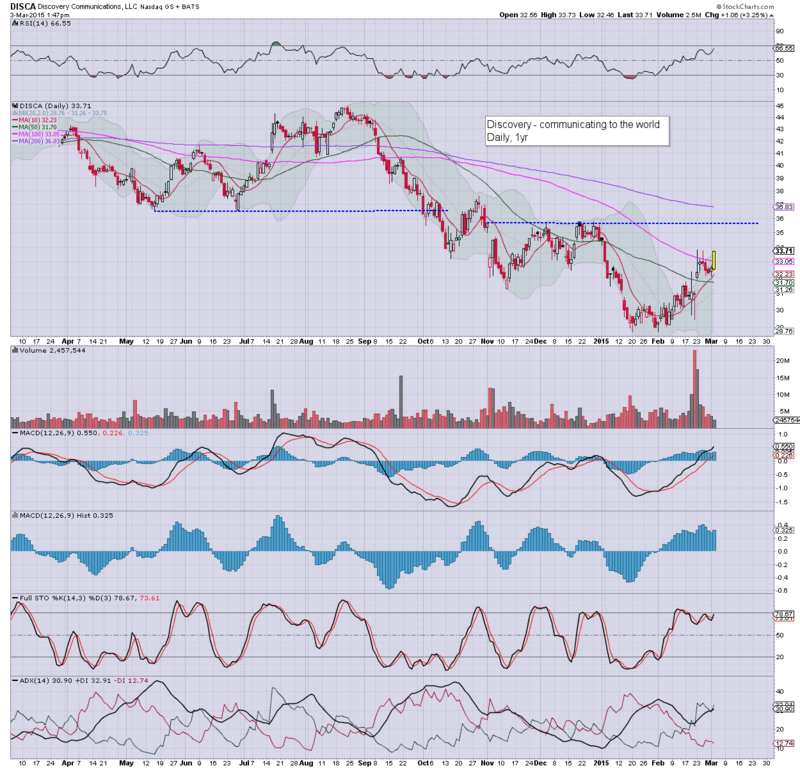 Notable weakness, Ford (F), -2.4%.. after vehicle sales data. 10.27am... it remains pretty lame how its difficult to even hold an early decline of just -0.5%. The one thing the bears do have... daily MACD cycle is due to see a bearish cross today/tomorrow for most indexes. So.. if break <2100.. then its a case of flooring in the 2080s... or somewhere close to 2065. Right now... VIX max' case are the 18s, but that is declining each day. Good morning. Futures are a little lower, sp -6pts, we're set to open at 2111. Metals are a touch higher, Gold +$2. Oil is set to open broadly flat, but as ever.. set for further significant intraday swings. So... a little weakness to start the day, but considering yesterdays set of new highs, there is little reason to hope of a trend change. Maybe a minor retrace from the sp'2120/30s... to 2070 or so, but really... it is arguably a pointless level to consider shorting from...even for the day-traders. Somewhat understandably, the cheer leaders on clown finance TV were pretty joyous this morning as the Nasdaq Comp' broke the giant psy' level of 5K. Yet... things really only get interesting with a monthly close in the 5200s. From there... 6K is easy.... then 7K... and... far beyond. As I have been noting for many months, 5K seemed a given.. and here we are... and its not even officially spring yet. Whether the intra high of 5132 is broken this month, April... or a little later... should make little difference to those who are broadly long the US equity market. For me.... a monthly close in the 5200s will be utterly decisive, and a clear warning of a viable hyper-bubble into 2017. Tuesday will see very little. Yellen is due to speak.. but it will be on bank regulation, and I don't believe the market will consider it important. 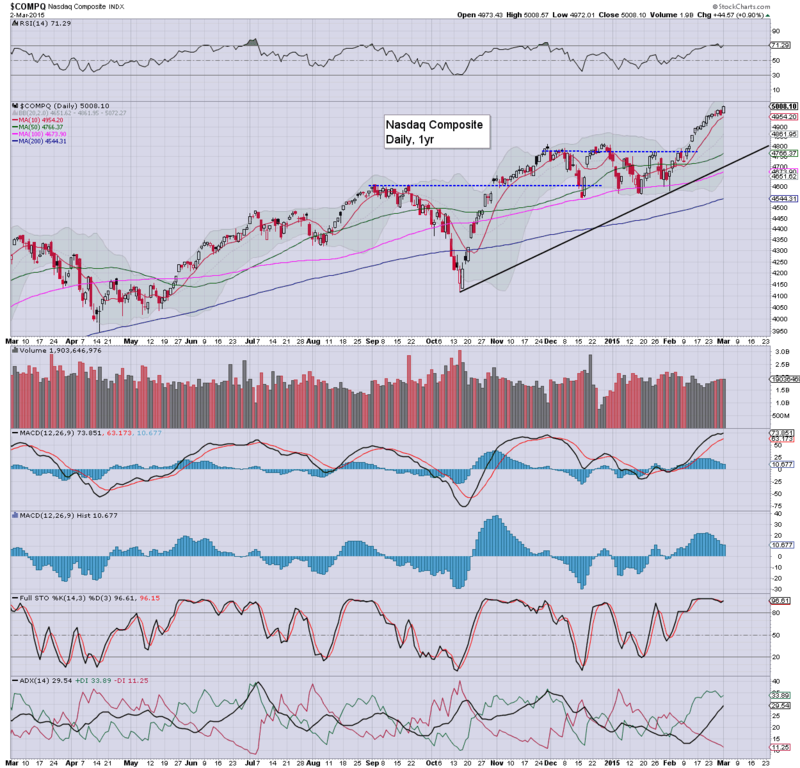 US equities broke a trio of new historic highs, with Dow 18288, and R2K 1243. 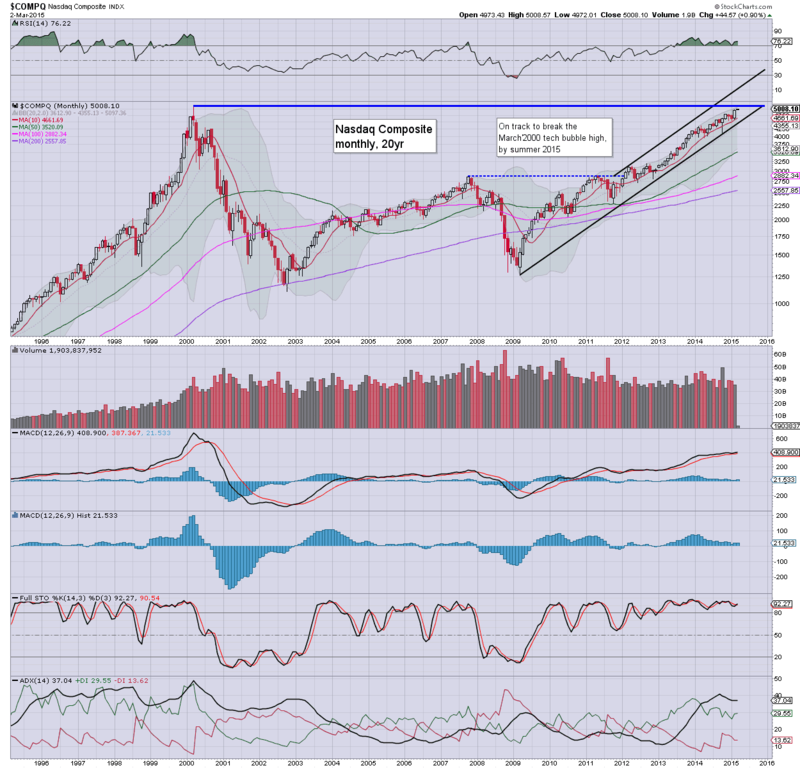 Most notable though, was the Nasdaq Comp', hitting the giant psy' level of 5000. 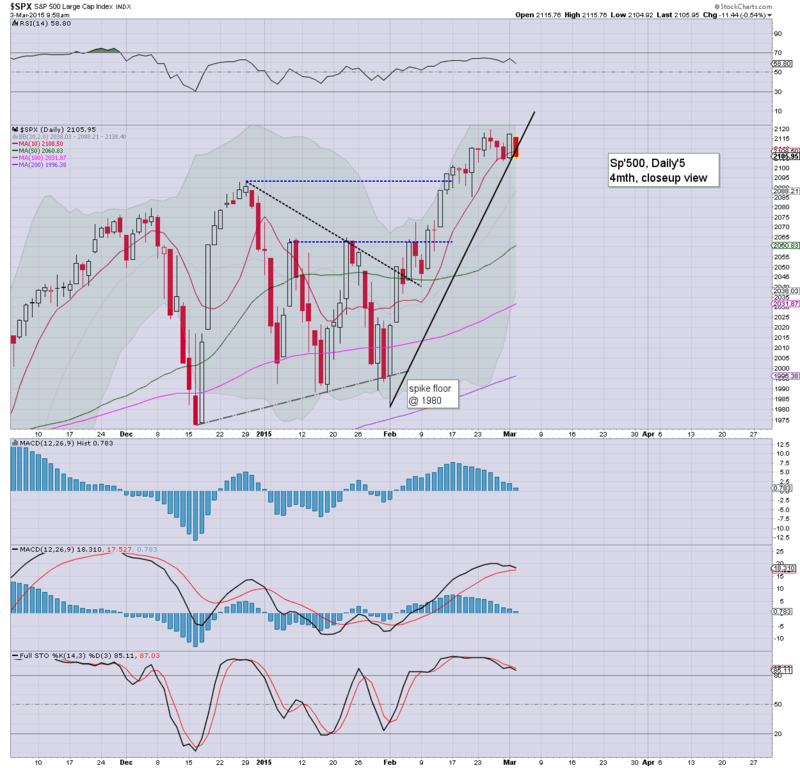 Near term outlook offers the sp'2130s into the monthly jobs data... before the next minor retrace. *I've left a retrace target on the sp'500 chart, but for now... that is on hold. It'd seem we'll more likely start a retrace from the 2120/30s... and then get stuck in the 2070s or so. Anything under 2050 looks unlikely for some considerable time (as in months... not weeks). Little to add... on what was just another day for the equity bull maniacs. With the Nasdaq Comp' achieving a daily close in the 5000s... next target is the intra high of 5132. It would seem is it just a matter of when we'll see a decisive monthly close in the 5200s... not if.